Yesterday Eltayeb learnt the word “knee”. He is 17 and his knee is sore from a football tackle. It’s bad news, not just because he won’t be able to play football for a while but because he won’t be able to risk jumping on a lorry to take him from Calais to England. 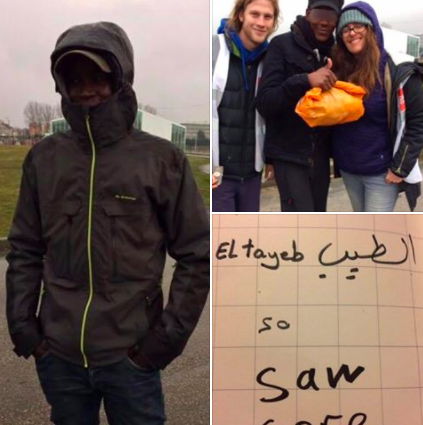 Care4Calais volunteers come here regularly and this week I’ve been one of them. Thirty years ago I got my TEFL (teaching English as a foreign language) certificate and the training has come in handy again after a long time out. We do the present tense. “I live in a forest!”, Eltayeb says, and smiles. “I live in a forest!” He can’t believe it either. It’s on the edge of Calais. We do the past tense. “Four people died on the boat,” Mohamed says. He doesn’t smile. Not till he gets onto his favourite team again, Manchester United. His memory for scores, players and the dates of trophies is amazing. The next teacher needs to look at the future tense with them. With the boys round the table are men from Afghanistan, Ethiopia, Eritrea, Iran, Iraq, Egypt.. Nearby others play chess or cards or Connect Four or look at their phones or sleep on the floor. At 4.30pm the centre closes and everyone heads slowly out back into the rain. But who’s that round the corner? It’s Care4Calais of course! More volunteers have arrived in vans – one has sleeping bags and packs of socks, scarves and gloves, the other brings hot tea. Another man, Mhretab (pictured here with Aisha and Ash), left Eritrea a year ago and also has his heart set on London. “I have two brothers and a sister there.” He will keep working to that goal, however long it takes. To anyone thinking of donating to Care4Calais, I can tell you it’s all going to good use. The clothes and equipment are vital. The interaction is vital. And to anyone thinking of volunteering, I can only say: go ahead. You will make a difference and meet amazing people, inside the warehouse and outside in the streets and day centres.